Now Dario Silcock has left the Exclusive Brethren organisation, he feels he can pursue his career choice - studying for a degree in musical theatre at Trinity College in London. 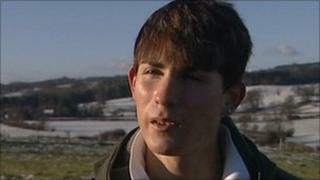 But the 21-year-old from Oswestry, Shropshire, has left at a cost, no longer being with his family. The Exclusive Brethren, which has about 20,000 members in the UK, adhere to a set of strict rules which Dario began to question as a teenager. The organisation is an Evangelical Protestant Christian church and a rigid code of conduct based very strictly on Bible teaching is at its core. Members cannot watch television, listen to the radio or go to the cinema as part of leading a life that avoids anything regarded as sinful. They must also avoid people who do not follow Exclusive Brethren teaching. Confiding in a teacher about how unhappy he was in the organisation also led to her suspension from a Brethren school in Buckinghamshire over allegations of an improper relationship between the two. Dario struggled with the rules and did not know where to turn for guidance, particularly when he realised he was gay. He said: "I was happy when I was a child even though the older I got the more I was questioning what the religion was about. "I wouldn't be allowed to go out with friends from school and school trips - I wasn't able to go out with. "I didn't know but I had a feeling I was gay. "That was quite a big problem for me because in the Brethren it's totally not accepted. "So I started praying and I prayed probably up to the age of 18 that I would turn straight and I did feel isolated." When he was 16, Dario was sent to a Brethren school, in Sefton Park, Stoke Poges. It was where he met head teacher Sue Turner, whose support and advice saw her being suspended in July 2006. His depression escalating, Dario confided in her over several months. But when the Brethren community found out, she was suspended after it was alleged she had had an improper relationship with him. She said: "The overall implication was that I had been encouraging Dario to leave the Brethren community and that I had been trying to develop an inappropriate relationship with him which was absolutely not true. "I always said to Dario, my advice was you're too young to leave at 16 and just walk away." She was later cleared of any wrongdoing but resigned and lost contact with Dario. They were reunited after he left the Brethren in 2007, aged 18, and asked her for help. She said she agreed to help him as he was an adult. "We opened up our home to him and he's been with us for the past three and a half years." Dario, who still lives with his former teacher, said he missed his family but also now felt happy with his new life. "One thing they (the Brethren Elders) said, that when you leave you won't be happy, but I'm the happiest I've ever been at the moment," he said. Ms Turner said she felt for his mother now he was no longer living with her. Brethren guidelines do not permit members to live with people who are outside the organisation. "We see ourselves perhaps as an additional family to support him," she said. The Brethren told BBC Inside Out West Midlands that they see homosexuality as a deviation from a normal godly lifestyle. "We believe in the preservation of the traditional family unit," a spokesman said. The organisation said it would not comment on staffing matters when asked about Ms Turner's suspension.